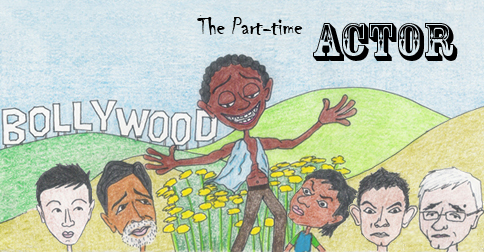 Number Nine: The Part-time Actor. A stormy July night. The clouds are heavier than a Naipaul novel. It’s almost 11 pm. And he’s almost here. I am sitting at my favourite coffee shop; only this time, we are living another day, another boy. Another boy who is late, another boy who loses a crucial brownie point. Just when I feel like I’ve been stood up, someone taps me on my shoulder. It’s him. The man is impishly cute, with short hair and shorter stubble. ‘Did I keep you waiting?’ he smiles like they do in the movies. It’s shy but unsettling. Maybe it’s the light? It’s always the light. I smile back at him. Who cares about brownie points anyway? ‘Can we order something, I am famished,’ he says to me. He runs a production house by day, attends combine training classes in the evening and sweats it out at the gym in the night. Like most gay men, he does not have time or calories to spare for unnecessary cups of coffee. I push my emptying mug away. Fifteen minutes later, over a second cup of cappuccino and a dry sandwich, Nine tells me he wants to be an actor. Should I be surprised? Should I laud him for having larger-than-life dreams? Should I walk away and laugh myself to sleep? Why do all attractive gay men want to try their hand at modeling, asked no one ever. ‘Sounds fascinating,’ I giggle a little too loudly. Second cups of cappuccino always make me spritzy. Uh-oh. Emotions run high on first dates. There’s always that one thing that you say that can decide whether you pick up the tab for the night, or pick up the boy instead. I steer the conversation away from the former. But what about the production house? Is he planning to shut it down? ‘Are you mad?’ he scoffs. (I don’t say anything. Any man who questions my delinquency rises higher in my lust list.) It’s too early to decide anything, he tells me. Plus he doesn’t fancy the prince-to-pauper story. Fairytales in reverse make no sense, we both agree. He’s going to shuffle between the business and the auditions, as I shuffle between deciding whether I like him or not. The former shouldn’t be too difficult – gay men are quite adept at handling double lives, and this one seems like a professional. The latter will take more time. Or another cappuccino. So much so that he has absolutely no idea. Cue for me to feed his insecurities. It’s a common dating tactic in the city – When things seem bleak, go straight for the jugular. How do we begin? ‘ You are really handsome,’ I half-lie. He’s good looking, but he’s not good looking enough. ‘I know,’ he shrugs it off and my self-worth nosedives. What else did I expect? A tennis game of compliments? A sudden declaration of love? This isn’t a movie scene, neither of us is a movie star or ever will be. The hypothetical lights change for the rest of the scene, night. He drones on about his weekend classes at a top acting school ( the second best in the city), as I nod my head like a stage puppet. Midway through his monologue on the nuances of method acting, I realize that the curtains are closing. ‘What do you think?’ He asks me. There’s a hypothetical life chart in front of us that I can’t see. Do I tell him that he’s going to be a successful actor? He could play the hero’s best friend, or younger brother but a self-made superstar with a sea-facing bungalow in the boroughs of Bandra? Not really. There are thousands others like him, hopeful fresh-faced boys with dreams that can be sold in cartons. Boys with handsome faces but not movie star good looks – each trying to make his mark and stand out in a sea of too-pretty-to-be-true men. Nonetheless, a sea I would not mind taking a dip in. Dreams can always be crushed later. Being a better version of yourself on the first date is a classic date move. He tells me that we can begin with reading lines for an Indian adaptation of Oedipus that’s due next week. He plays the protagonist, I play everyone else. Does this have a sequel? : Yes. If this date were a song, it would be: ‘Billionaire’ by Travis McCoy Feat. Bruno Mars. Previous PostNumber Eight: The Celebrity Stylist.Next PostNumber Ten: The B-Schooler.